Isn’t it pretty? 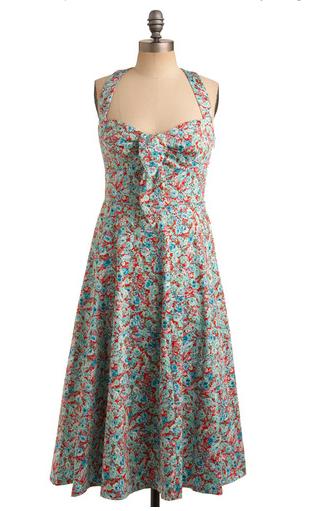 My plan is to wear it to Blobfest and the Blob Ball since it has such a 50’s feel to it. Unfortunately, I am trapped inside of it and can’t get out. I thought I’d try it on but the damn zipper decided to stick (which appears to be a common issue with this dress) It’s too tight in the body to pull over my head and clearly, it ain’t going over my hips. My mom said if I give her an hour, she’ll come over and try to help but honestly, I think I may have to take scissors to it. This situation reminds me of a time when I was a little girl, probably around 8 or 9-years-old. It was 1983 and I was in the original Zipperhead in New York City. What was a 9-year-old girl doing in Zipperhead late at night? My parents took Lisa and me to see my cousin Johnny’s art gallery showing and across the street was Zipperhead. My father was intrigued by it and insisted we go in. There was a dressing room to the left of the entrance and in front of it, on the ground, was a woman, grunting. Gathered around her feet were three Zipperhead employees, trying desperately to peel the PVC pants off her frame. She wore tiger-printed underwear. I was quite disgusted by the situation but Lisa thought it was great. That Christmas she asked Santa for PVC pants. My father bought her not only the pants but also a matching jacket and hot pink, leather skinny tie. The present was signed, LOVE SANTA! She was truly the most awesome dressed first-grader ever! UPDATE! The zipper dislodged and I am free! This entry was posted in Clothes, Links my father sent me on June 19, 2011 by Donna. HELP! I am headed to my the Reunion Gala and I have NO IDEA WHAT TO WEAR!!! This entry was posted in Clothes on June 4, 2011 by Donna. I remember it feeling a little more summery than it is. I think I got lost in the faux Marimekko design and it hooked me. Forever21 has no return or exchange policy so it’s mine FOREVER! And I am wearing it. Feeling a little Judy Carne-ish. Although that might be due to the intricate tattoo of subversive writing I have that covers my entire body. This entry was posted in Clothes on May 7, 2011 by Donna. I went shopping today with TWO Gift Cards from Wunderlabel Spain held tightly in my grubby little hands. You see, Pookie Bear bought me two sweaters for Christmas that didn’t fit and when I went to return them I found I could only get a gift card. Yeah, I’ve had a Macy’s Gift Certificate burning a hole in my pocket since CHRISTMAS! That’s not the only one! Recently my Aunt Helen sent me a TJMaxx gift certificate because I helped delouse her computer. I love TJMaxx and I’ve been wanting to use this one up but I wanted to wait for the right time. Today was the right time, so I grabbed my gift cards and painted the stores red. I bought 3 dresses, 1 black pencil skirt, 1 black jacket, 3 pairs of mamasita underwear, & 2 bras! All of this for less than $150.00! And I still have $30.00 left on the one card! The dresses are gorgeous and I looked all over the Web trying to find photos that I could post but unfortunately I came up empty. All three dresses are black and white– yes, I am obsessed with black and white movies and black and white dresses– but they are all very different in style and print. The one dress is black and white striped, the other is black and white giraffe print, and the last one is black and white polka dotted. It feels so nice having some new clothes. Oh! And that’s not all! 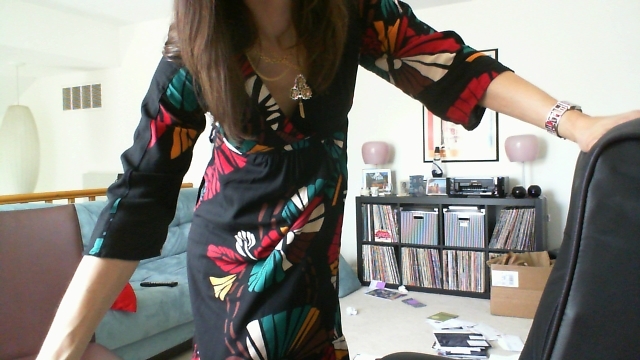 The other cool thing is my mother was out shopping last week and she found a Talbot’s dress for just $10.00! She scooped it up for me and I absolutely love it! So I have 4 NEW dresses! Awesome! This entry was posted in Clothes on June 13, 2010 by Donna. Off to the gym! I am wearing my only pair of sneakers. I purchased them in Dresden back in 2001. Do you think it’s time I buy a new pair? This entry was posted in Clothes on June 3, 2010 by Donna. I found two dresses on the Old Navy site I really want… and yet I know that they never ever ever look as good on me as they do on the model or in the picture on the Website. That striped number looks like something Ingrid Bergman wore in Intermezzo. I can see her sitting at a cafe with a scarf knotted around her neck, sipping an espresso as Lesley Howard loves her with his eyes. The other one looks like something Charo wore on the Love Boat. This entry was posted in Clothes on May 20, 2010 by Donna. I am really worried. Perhaps this is proof that I actually am in my mid-30’s! Somehow I felt compelled to go Talbot’s Website…. AND I LOVED THE CLOTHES!!!!! Talbot’s clothes were always matronly and shapeless and ugly. Have they changed? Or have I? This entry was posted in Clothes on April 29, 2010 by Donna.